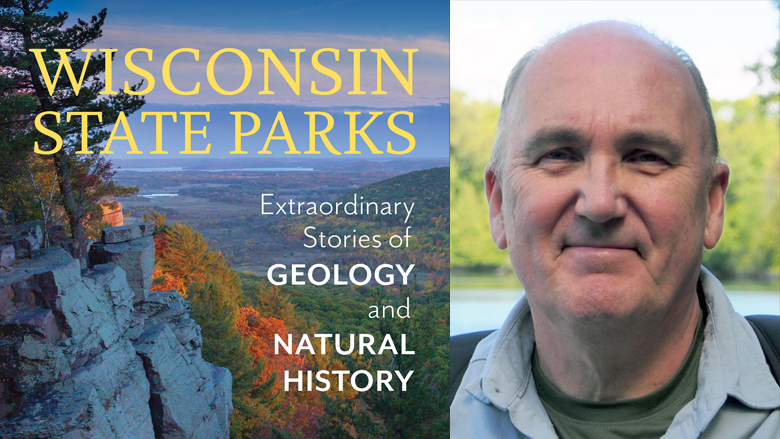 Science writer and naturalist Scott Spoolman not only knows Wisconsin’s natural world well, his fine new book, Wisconsin State Parks: Extraordinary Stories of Geology and Natural History, reflects a lifetime spent in the woods and wilds of the state. Part guidebook and part journal, Wisconsin State Parks explores 28 of Wisconsin’s more than one hundred state parks, forests, and recreation areas, providing the reader vivid and lively accounts of the landforms, waterways, flora, and fauna he finds along the way. When you are hiking on one of the many trails in the park that pass through small groves of white or red pine, stop for a moment and close your eyes. Smell the scented air and listen for the delicate song of the wind in the pines. You might then imagine yourself to be in the vast, deep forest that once stood here atop gravel and soil dropped by the glacier, atop sandstone and limestone deposited by ancient seas, atop a bedrock of basalt laid down a billion years ago. Wonder at the natural beauty and the geologic history of the region seems to be the default mode for Spoolman, and his on-the-spot observations come across as deeply felt personal experiences as well as invitations to readers to have their own at these beautiful natural sites. Slow down and be in nature is the vibe I felt when I read Spoolman’s work—especially in his numerous “Trail Guide” sections, which will be especially valuable to those who want to follow, literally, in his footsteps. waterfalls, but its trails lie easily in a quiet, undisturbed forest. and reminds you that such beauty is also quite spectacular. Not only is Spoolman an engaging writer, his prose is complemented by the many beautiful, full-color photographs he took in every place he visited. An array of informative maps and charts round out this attractive, well-made book. I found the geologic timeline a particularly apt complement to the author’s dramatic descriptions of vulcanism, glaciation, and plate tectonics over periods ranging from tens of thousands to millions, even billions, of years. An unexpected pleasure of this book was the soothing effect that accompanied my contemplation of the eons and their inexorable forces upon the land we now call Wisconsin. Deeply imbued with the ethos of stewardship and conservation, Spoolman’s Wisconsin State Parks: Extraordinary Stories of Geology and Natural History is a welcome and timely reminder of the wealth of our natural resources here in Wisconsin—and perhaps what we stand to lose if we continue to live as we do.